FULTON – The Fulton City School District has expanded after-school options for elementary school students who thrive on hands-on creativity. 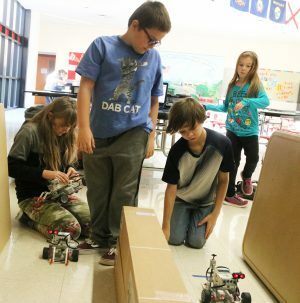 Fulton City School District elementary students test their LEGO robots during the robotics module of the new STEAM after-school program at FJHS. The new science, technology, engineering, arts and math (STEAM) after-school program has attracted about 175 students in grades four to six to the Fulton Junior High School from 3:30 to 5:45 p.m. Mondays to Thursdays. Students have been abuzz with excitement over modules of robotics, drones, sustainable living, gaming, kitchen chemistry, innovation and engineering and survival throughout the 2018-2019 school year, according to coordinator Michelle Briggs. All participants are bused from their respective elementary school to FJHS and they may be transported via bus back home or their parents or guardians may pick them up. STEAM opportunities are offered to students for free, thanks to a $1 million Title IV Student Support Academic Enrichment Grant recently awarded to the district. Following a two-week summer enrichment STEAM camp, the after-school program has sought to further develop student’s life skills and STEAM interests for the current school year. Briggs said students and teachers alike are already learning alongside one another. All modules were chosen by students, based on interests from the summer program. Students will also offer a showcase of learning to friends and family at the end of each module. During the robotics module, Fairgrieve fourth grader Hannah Arnold said she was most excited to program a LEGO robot to travel around a maze. Periods of trial and error helped her to overcome related obstacles. Evangelena Coe, Granby Elementary fourth grader, said the program has provided her more inspiration to possible be a robot scientist when she is older. The program is supported by FCSD teachers and teaching assistants, including some from FJHS so they can familiarize themselves with students who soon will enter the junior high school. Also available on sight are technology integration coaches Jessica Somers and Brad DePoint who will assist with both STEAM after-school program needs and provide technology integration back into the classrooms at Granby, Fairgrieve, Lanigan and Volney elementary schools.